For many years now Melissa Sweet has held the distinction of being one of my absolute favorite illustrators. I love her bright, playful watercolors, particularly those that incorporate collage elements that add surprising splashes of texture and color to her delightfully uplifting images. Melissa and I met for the first time at the New England Independent Booksellers Association fall trade show several years ago, when she and Jacqueline Davies were signing copies of The Boy Who Drew Birds. Since that time we’ve exchanged intermittent e-mails, with them recently taking the form of sharing our favorite means of distraction (have you seen this blog? looked at this artist’s collage work? bought this fabric? etc.). 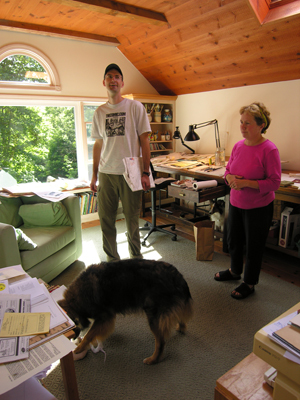 We had spent almost zero time together, though, until this past Saturday, when Gareth and I visited Melissa and her husband Mark at their home and studio in Rockport, Maine. 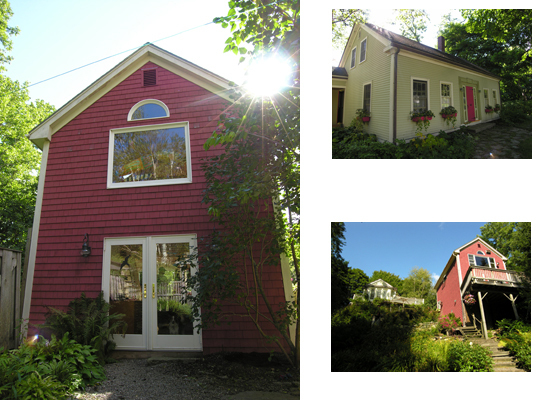 Suffice it to say that Melissa’s house, studio, and husband are every bit as bright and welcoming as the books Melissa illustrates (and writes, in the case of Carmine: A Little More Red and the forthcoming Tupelo Rides the Rails). Gareth and I stayed at Mark and Melissa’s place for four hours and could easily have lingered for several days more had we not eventually had to drive back to Boston (and had Mark and Melissa not needed to get on with their lives). 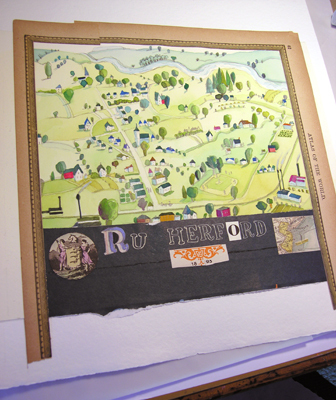 What follows is an inside look at Melissa’s studio and a sneak peek at the book she’s currently illustrating, A River of Words. It’s a picture book biography of William Carlos Williams, written by Jen Bryant, to be published by Eerdmans. As an aside, I’ll mention that I really enjoyed Jen Bryant’s free verse novels The Trial and Pieces of Georgia — enough so to include the galley of her forthcoming novel Ringside 1925 in the pile of books I took with me to Maine… and then barely touched during my time there. The one thing this vacation lacked was a plane flight that would grant me some uninterrupted reading time! 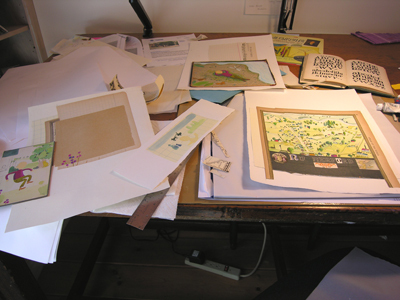 And now we take a look at the first floor of Melissa’s studio, where she’s got copious volumes lined up on shelves, countless pieces of art in flat files, and a table currently covered with old books she’s dissecting for the illustrations for A River of Words. 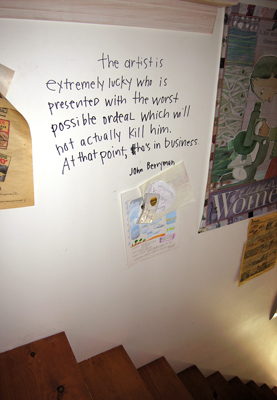 On we go, up the stairwell, where Melissa has written a wonderful John Berryman quote on the wall. I’ll type it out here so that no one has to reach for his or her reading glasses: "The artist is extremely lucky who is presented with the worst possible ordeal which will not actually kill him. At that point, he’s in business." And now we’ve arrived at the second floor. In the top photo we see Gareth on the left, Melissa on the right, and Rufus on the floor, playing with his favorite toy. In the bottom photo we see Melissa’s desk. 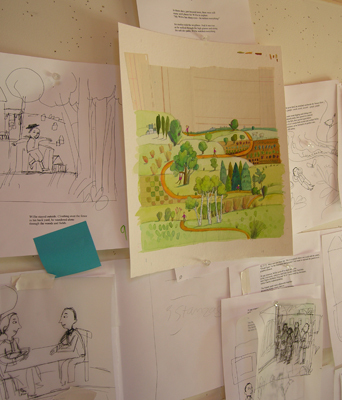 Below is a close-up photo of the one watercolor currently tacked to the board, and some of the sketches around it. See the sketch on the right of the boy reclining beside a stream (or some other flowing body of water)? 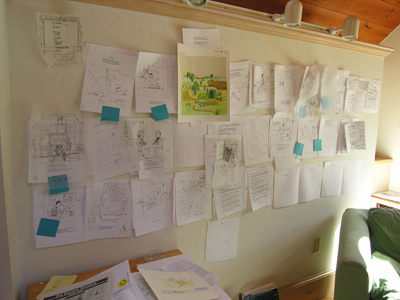 Look back at the photo of Melissa’s desk. 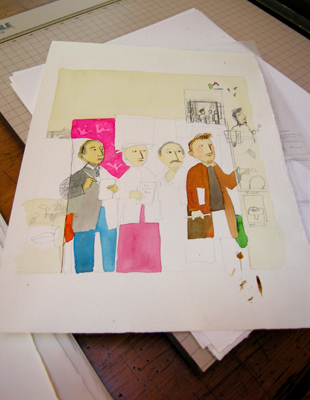 There’s a watercolor near the back of the desk based on said sketch. Haven’t had enough? Okay, then, here are two more watercolors in the works. Notice the old book spine Melissa has cleverly altered in the bottom photo. I asked Melissa how far ahead she’s booked, and the answer was two to three years. 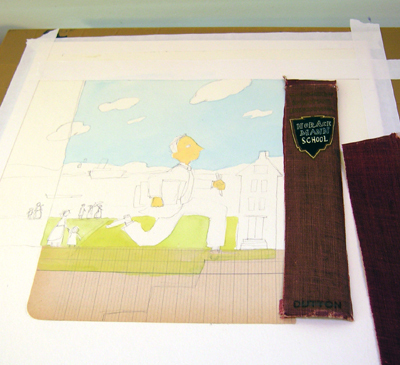 In other words, it won’t be long before these watercolors and sketches are replaced by an entirely new set, and more Melissa Sweet-illustrated books are delivered into the hands of readers. Lucky, lucky us! This entry was posted in Uncategorized on September 6, 2007 by Alison Morris. 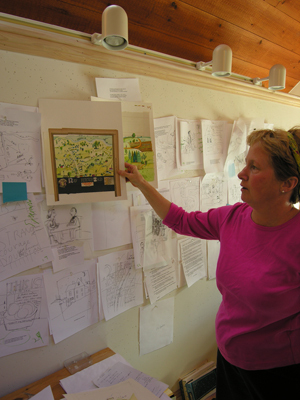 Alison, reading your entry and seeing Melissa’s studio and work was such a treat! Thanks for sharing! Can’t wait to see more! I love, love, love Melissa’s work!!! I’m crazy about Carmine. 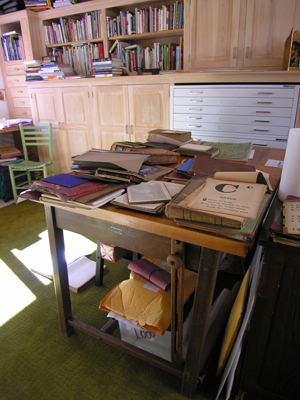 You really must check out Tomie DePaola’s studio. Inspirational! And it’s right next door in New Hampshire. I love Melissa Sweet’s work. One of my favorites of hers is Rosie Runs Away. Her mastery of watercolors is simply amazing.